Malaria infects 515 million people each year, killing one to three million children, yet currently there is no vaccine.1 Arsenic poisoning from contaminated drinking water affects 157 million people.2 And although bright minds exist all over the world, representatives from the developing world have a minimal voice in the international science community. These are some of the issues that catalyzed the formation of Scientifiques Sans Frontières Australia (SSF Australia). In partnership with Community Waterwatch Australia and Waterkeepers Australia, SSF Australia is helping high school students to learn—in the field—more about their local waterways. SSF Australia is a science-based charity that seeks to alleviate the imbalance in education, resources, and health in the world. We realized that scientists have unique knowledge and skills, which are lacking from many humanitarian aid programs. We focus on community-identified scientific problems and, therefore, we are not primarily serving the interests of either academia or industry. This is our mission, to provide the scientific link in the humanitarian aid network of nongovernmental organizations (NGOs). SSF Australia was born in 2005 when some of our founding members attended the Pacifichem 2005 conference in Honolulu. During the conference, many people observed that researchers from developing countries in the Asia Pacific region were under represented. This galvanized us into action with the idea for SSF Australia. Our vision is of a world in which every individual and community have adequate access to the scientific resources, knowledge, and technology necessary to meet their self-identified needs. Our drive was, and is, to partner science expertise with communities in need, in a manner that directly addresses the underlying issues and in a not-for-profit capacity. We aim for an organization that allows scientific knowledge and expertise to influence people’s lives in a relatively short time frame because there are many areas where scientific skills could be applied. Initially, we believed our only option for our cause was to go through one of the various scientific institutes already established in Australia, such as the Australian Academy of Science, or, being chemists, the Royal Australian Chemical Institute. However, we quickly realized that these organizations have aims quite different from our own, and we would not obtain the level of support needed. Therefore, we founded a new science-based charity, inspired by the achievements of Engineers without Borders Australia. 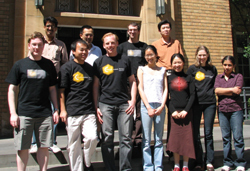 Fortunately, similar minded people in the USA had started CWB in 2004 <www.chemistswithoutborders.org>. They share many of the same passions and goals that drive us, and so the Australian chapter was formed as CWB Australia. However, as the organization grew, both in membership and programs, we found the name “chemists” was exclusive. Not only that, but we recognized that we needed an interdisciplinary approach to solve our targeted issues. This generated much discussion within the organization, but our final decision was to become Scientists without Borders Australia. In April 2007, we re-branded and re-launched as Scientifiques Sans Frontières Australia. In our formative stage, we were inspired by the founder of Engineers without Borders Australia, Daniel Almagor. He spoke to us about the need for a paradigm shift within the engineering discipline to enable engineers to become directly linked with communities in need, so their expertise would make a positive contribution toward diminishing suffering and assisting development. SSF Australia dreams of doing the same for the sciences. We want materials scientists to ask themselves if their work can be easily applied in the developing world. We want agricultural scientists to ask themselves how their knowledge could be of assistance to farmers in drought-prone areas. We want scientists throughout the world to be proud of their achievements, not only on a cerebral level, but because their work satisfies their consciences. Our vision is of a world in which every individual and community have adequate access to the scientific resources, knowledge, and technology necessary to meet their self-identified needs. SSF Australia envisions a scientific community where the transfer of knowledge and technology is at the forefront of every scientist’s mind. Fundamental to this vision is our conviction that each individual has the ability and the responsibility to make a positive impact in the world. Our charter is to work with communities to improve the quality of life of people in the lower echelons. This can be achieved through educating and by implementing customized and sustainable technologies. Also, through the process of helping people, members become more socially aware and responsible. To achieve this, we are engaging with scientific students, professionals, and industry, as well as the broader community. SSF Australia has four main objectives: assisting the development of international science; integrating science solutions into the community; engaging scientists in ethical discussions and practices; and providing science education to the general community. SSF Australia runs a range of programs that satisfy each of these core goals. Currently, much of Australia is experiencing drought conditions and communities are becoming increasingly concerned about their local waterways. One aspect of the problem is the mismanagement of some important riparian environments. In partnership with Community Waterwatch Australia and Waterkeepers Australia, SSF Australia is helping high school students to learn more about their local waterways. This consists of understanding the ecology and geology of the surrounding landscape, the human impact on that ecology, ways to manage the impact, and environmental restoration. Students not only learn, but work with SSF Australia to put knowledge into action. This enables them to better retain what they have learned, to improve the local environment, and to gain pride in their own community. By putting science into context, students may even be motivated to pursue a scientific career. One of the largest differences between the developed and developing world is access to resources. To counteract this imbalance, SSF Australia manages a scientific education resource appeal, aimed at collecting and distributing scientific resources to secondary and tertiary education institutions in the Asia-Pacific region. Currently, this effort is focused on supplying textbooks and other educational material, with plans to extend this to scientific equipment and further resources to assist developing world research. This program has developed from our involvement in the Engineers Without Borders Australia’s “Guns to Pens” program <www.ewb.org.au>. Donations are always welcome, as long as the resource is up to date and is in good condition. Education is the key to creating opportunities. Unfortunately, those who are in the greatest need of opportunities are generally those who have the least access to education. This can be due to a variety of reasons; language difficulties, cultural restrictions, and a lack of financial resources are just a few. One of SSF Australia’s core objectives is to increase science literacy in the general community, and we are helping to achieve this by providing tutoring in science-related subjects to students from disadvantaged backgrounds. These are run as small workshops once a week. One of SSF Australia’s objectives is to improve the science profession. To reach this goal, we host a seminar and workshop series aimed at informing science students about aspects of science usually missing from a university degree. These cover a range of issues, such as ethics of science, legal and intellectual property topics, negation skills, science and the media, and the relationship of science to politics. An SSF Australia group in Melbourne. SSF Australia is dedicated to enhancing research in the developing world. As such, we are developing an exchange program in the Asia-Pacific region that we hope will enable early-career scientists from leading institutions to essentially trade places with early career-scientists from the developing world. Both parties will benefit from the exchange by receiving exposure to the struggles and strengths of each environment. Mutually beneficial collaborations can be established between parties that otherwise would not meet. We hope such an exchange will increase the skills and access to technology, through collaborations, of scientists in the developing world. We hope that developed-world participants will find increased meaning in their research and will gain unique experiences. Future projects of SSF Australia are aimed at developing scientific research in the Southeast Asia and Pacific region, as well as increasing the scientific literacy of the indigenous people of Australia. To achieve our vision, we must engage scientists globally. Concerned scientists must reach out to their communities, companies, professional organizations, and political and international bodies in order to secure a more sustainable future. SSF Australia aims to be a forum for discussion and action by the scientific community. SSF Australia’s higher standard of responsibility and care for others must be integrated into the lives of individuals and communities. SSF Australia seeks to work in partnership with other organizations and believes that collaboration is vital to finding socially, economically, and environmentally sustainable solutions. All of us, through our specialized experience and training, have something exceptional to contribute to the world. So, this is our call to you, please help us use scientific expertise to positively change the whole world. Contact SSF Australia to find out how you can become involved. Join with us on this exciting venture. SSF Australia would like to thank the following for their support in the early stages of development: Faculty of Science, University of Melbourne, the Chemistry Education Association Australia, the Royal Australian Chemical Institute, and Chemists without Borders USA. 1. R.W. Snow, C.A. Guerra, A.M. Noor, H.Y. Myint, S.I. Hay (2005). “The Global Distribution of Clinical Episodes of Plasmodium Falciparum Malaria.” Nature 434 (7030): 214-7. doi: 10.1038/nature03342. PMID 15759000. Colin Scholes <cascho@unimelb.edu.au> is the founding president of SSF Australia and is a research fellow in the Cooperative Research Centre for Greenhouse Gas Technologies, University of Melbourne. Glenna Drisko is the education officer of SSF Australia, as well as a founding member. She is also a Ph.D. student under the supervision of Rachel Caruso in the School of Chemistry, University of Melbourne. E-mail: ssfaustralia@ssfaustralia.org. Mail: PO Box 4237, University of Melbourne, Parkville, VIC, Australia 3052. Page last modified 19 March 2008.